Series contains correspondence between Barkhouse and a number of others. It is divided into three subseries: Letters from students, Personal correspondence, and Professional correspondence. File contains documents relating to Hall's lectures on differentiation. Materials include typed and handwritten notes, as well as a reading list. File contains documents relating to Hall's lectures on direct development. Materials include handwritten notes. File contains a directory of graduates and former students of Dalhousie University published in 1925. The volume contains a bookplate for Archibald McKellar MacMechan. 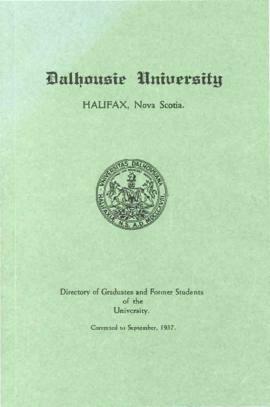 File contains 2 copies of a directory of graduates and former students of Dalhousie University published in September 1937. The directory is an update of a similar directory published by the Dalhousie Alumni Association in 1925. File contains documents relating to Hall's lectures on Epith-Mesen interactions. Materials include handwritten notes and a photocopied figure with text. File contains documents relating to Hall's lectures on evolutionary development. Materials include typed and handwritten notes, as well as lecture or presentation outlines. File contains documents relating to Hall's lectures on fertility. Materials include typed and handwritten notes. File contains documents relating to Hall's lectures on gastrulation. Materials include handwritten notes. File contains documents relating to Hall's graduate modules. Materials include handwritten notes. File contains a draft manuscript of a statement given at session four (of nine), delivered by Dr. Tom Parker, entitled "The Royal Commission Report: What it means for the teacher". File also contains a program of the sessions. File contains documents relating to Hall's lectures on growth and organ size. 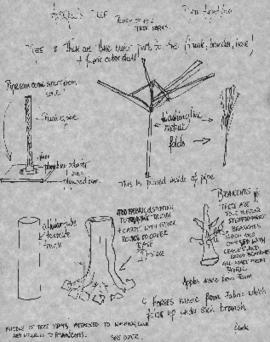 Materials include handwritten notes, as well as a hand-drawn graph. File contains documents relating to Hall's lectures on hair and skin. Materials include handwritten, photocopied notes, as well as figures.